In 1853 a group of missionaries sent west by the American Home Missionary Society of New York founded Contra Costa Academy in Oakland, and in 1855 it was transferred to the state and incorporated as the College of California. Congressional action in 1853 and the Morrill Act of 1862 brought gifts of public lands for colleges of agriculture and the mechanical arts, and California responded by establishing an Agricultural Mining and Mechanical Arts College in 1866. Governor Haight signed a new act in 1868 creating the University of California out of the combined resources of the College of California and the Agricultural College. UC Berkeley was formed in 1869 by merging these two fledgling institutions - the private College of California, in Oakland, and a state land-grant institution, the Agricultural, Mining, and Mechanical Arts College. 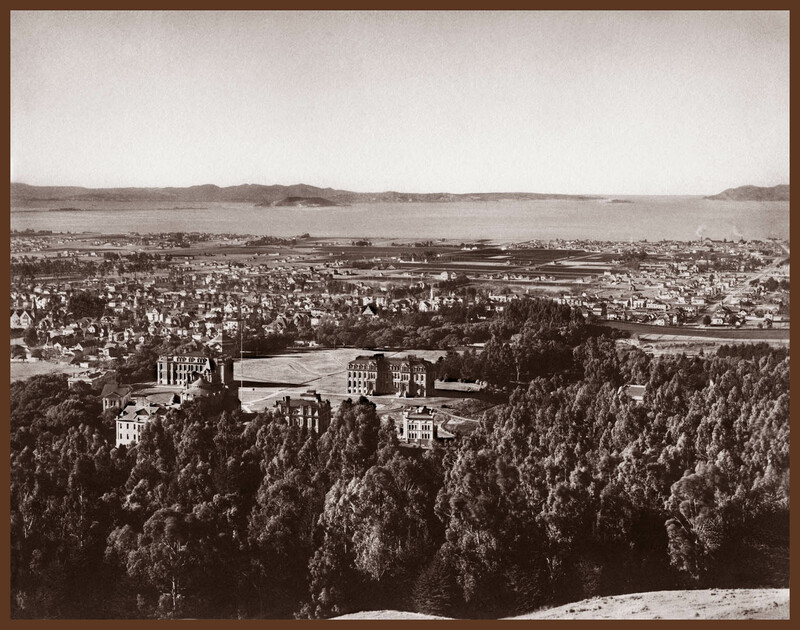 Initially Oakland-based, UC moved to Berkeley in 1873, and became a catalyst of economic growth and social innovation. The roots of the University of California go back to the mid 19th century, when hundreds of thousands of fortune seekers came west in the gold rush, California became a state, and farsighted drafters of the 1849 State Constitution dreamed of creating a university that "would contribute even more than California's gold to the glory and happiness of advancing generations." The "seat of learning" they envisioned was born nearly two decades later, through a merger of two fledgling institutions — the private College of California, in Oakland, and a new state land-grant institution, the Agricultural, Mining, and Mechanical Arts College. The former, led by former clergyman Henry Durant and modeled after Yale and Harvard, featured core courses in Latin, Greek, history, English, mathematics, and natural history, with the addition of modern languages. Though it had little funding, it had land — both in Oakland and four miles north at a town site eventually named for George Berkeley, an 18th-century Irish philosopher and bishop. Meanwhile the state college, created by the state legislature under federal land-grant legislation, had funding but as-yet no campus. Leaders of the two institutions decided to join the two schools to their mutual advantage, blending their curricula to form a "complete university." On March 23, 1868, the state governor signed into law the Organic Act, "to Create and Organize the University of California." A "tiny band of scholars" — 10 faculty members and nearly 40 students — made up the new University of California when it opened in Oakland in 1869. Construction of South Hall and North Hall on the northern site was promptly begun. In September 1873, the University and close to 200 students, led by UC President Henry Durant, moved to the new campus in Berkeley on land adjoining Strawberry Creek.